In 2009 major conservation work was initiated on the 16th century Church of San Pedro Apóstol in Andahuaylillas, a town in the Peruvian Andes, at 3,100 metres above sea level. The local parish and the World Monuments Fund, partners in the endeavor to preserve this historical monument, understood early on that a meaningful involvement of parts of the community counting 6,000 inhabitants was necessary to lend depth and sustainability to their efforts. In this sense they launched a three-year pilot program with the objective of encouraging local youth to actively participate in the study, protection, and advancement of their cultural heritage. 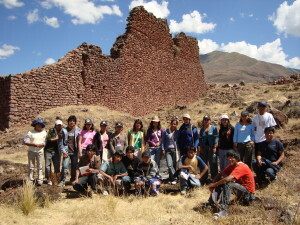 Through a series of workshops, excursions, and practical field exercises, the young men and women who have since been participating in this program have had the opportunity to explore the works of their ancestors and consequently become aware of the rich cultural legacy they have inherited. Additionally, they have been exposed to various documentation techniques that enable them to record both the material and intangible aspects of their culture and have developed means to interpret them in novel ways, making them more accessible to the community. Over time, the young group has matured and so has its members’ perception of the nature and value of heritage. They have expanded their appreciation beyond the most celebrated monuments such as the baroque churches and the archaeological sites, and their regard now encompasses the overall fabric of the historic town with its domestic structures and public spaces which they see as embodying traditional knowledge and values and as important purveyors of identity. Reflecting this development, they have created a participatory 3D-mapping model that includes technical drawings, texts, photographs, and video clips, and have invited the community to contribute their family stories, memories, and personal testimonies. 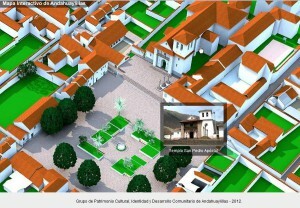 Members of the Ministry of Culture who have seen the 3D-map have been very impressed and think it could be effectively applied nationwide. 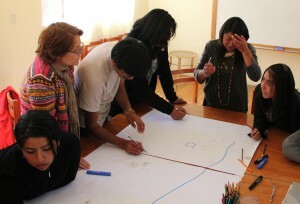 Conscious of the magnitude and complexity of this challenge and of the necessity to find partners to tackle it, they have organized public events, launched information campaigns, and produced educational material in an effort to raise the level of awareness among the rest of the population in the hope that a new found pride in their rich heritage will motivate them to get involved in its protection. During an election campaign, they reached an unprecedented agreement with local politicians to abstain from plastering the town with posters and to remove all painted slogans, inspiring other towns and districts to replicate this example. 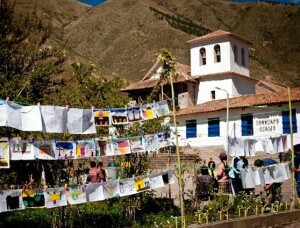 Following the inscription of Andahuaylillas as a National Historic Town in 2010, they have established a “Heritage Day”, a yearly celebration commemorating this event. A 10-minute video in which the youth group presents itself (in Spanish, with English subtitles). 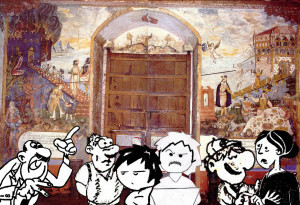 Have a look at the animated comic the group created for school children (in Spanish). 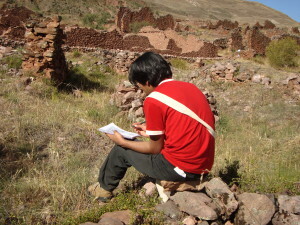 See the exhibition catalogue the group has produced with artists on the local quarry (in Spanish). A short video by the World Monuments Fund on the background of the restauration project of the church in Andahuaylillas.